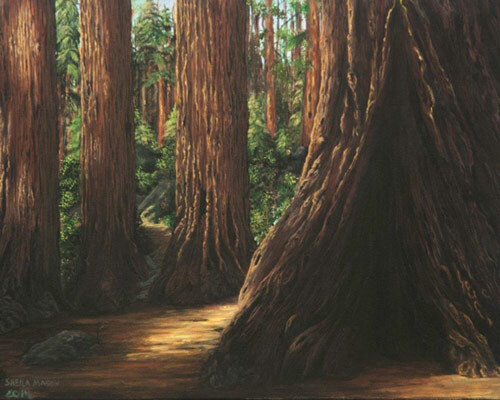 Mason’s stunning environment inspires her paintings and she has produced several works that focus on trees. Painting to her is about allowing the mind’s eye to stand among the trees and she hopes the viewer will be able to join her in smelling the forest and hearing the sounds that abound there. She seeks to pull the viewer away from the hustle and bustle of the minutiae of life to glory among the calm and wonder of the trees. She wants to refresh the viewer and to touch the soul. Mason is also an accomplished sculptor who concentrates on figures of strong women experiencing deep emotion. Often Mason’s figures seem to have a Native American look about them. When asked about the Native American influence, she can only simply answer, “It’s who was in the clay.” She hopes to make the viewer smile when her sculpture is viewed.